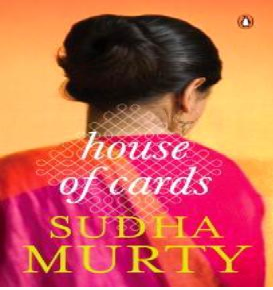 Sudha Murthy is known for her subtle writing. When it comes to storytelling she is a gem at portraying the delicate facts about human relationships. One of her themes relates to husband wives intricate relationship issues and ‘House of Cards’ is based on this theme. Murthy’s novel portrays a character Mridula, a young and beautiful girl who is full of life; she goes out of her ways to help others. She hails from a small village in Karnataka and is grounded with values. Mridula meets Sanjay, a talented but impoverished doctor, they both fall in love. Mridula ignores Sanjay’s physical deformity in hand and marries him. They settle in Bangalore. They face hardships in beginning still they survive with each other’s support and love. Time doesn’t remain same and sadness brews in Mridula’s life when Sanjay quits his government job and starts an immensely successful private practice. This story revolves around Mridula, Sanjay and their family members. This is story about life of a widow woman- Sanjay’s mother who survives the hardship of life by becoming a shrewd moneylender. This is story about Sanjay ‘s sister and brother-in-law who live a pretentious life and publicly parades themselves, their possessions, and their accomplishments, this very thing leads to debt and treachery. This story is about Mridula’s parents who live a contended life in their village and finally this story is about Sishir, Mridula’s son who lives a lavish life but comes face to face with reality when he meets a young girl named Neha. The more Mridula sees of the world, the more she realizes how selfish and materialistic people can be. But she does not take the ups and downs of life to heart, and lives each day with positive energy. Sanjay’s ambition blinds him towards humanity with opulence comes the incessant desire for more, and the inevitable slide into corrupt practices. For a long time, Mridula has no idea that Sanjay has traded in his soul; when the truth hits her, she has no recourse but to walk out on him. But can she really find a space of her own? Can she become old Mridula again? Was her house of love mere a house of card? This intricately woven novel explores human relationships in telling detail, and holds up a mirror to our society with honesty and with conviction. The story starts with a dedication “To all the Mridulas who suffer silently.” And with this line Murthy reaches out to those women who are suffocating inside their marriage which has been woven with selfishness. It gives the strength to all those who wants to put an end to life sucking misery of marital relationship and purse the path of happiness and contentment.